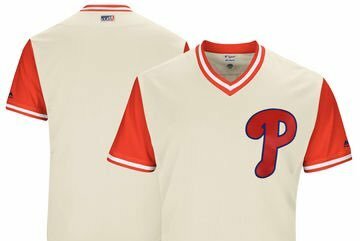 Here are the Phillies' Players Weekend uniforms. Last year, Bryce Harper set out on a mission to “MAKE BASKEBALL FUN AGAIN,” and with “Players Weekend,” which will take place later this month when the Phillies host the defending champion Chicago Cubs, Major League Baseball seems to be taking a small, but appreciated step toward addressing that problem. Major Leaguers will let their personalities and passions shine like never before when the newly created Players Weekend takes center stage during all games from Friday, Aug. 25, to Sunday, Aug. 27. Those are just 20 of the nicknames that players across all clubs will wear on their backs while sporting colorful, non-traditional uniforms featuring alternate designs inspired by youth-league uniforms. MLB and the MLB Players Association announced jointly on Wednesday that Players Weekend will be a player-focused field festival of sorts, different than anything seen before at the top rung of the sport. In addition to nicknames on the backs of jerseys made by Majestic, players can wear and use uniquely colored and designed spikes, batting gloves, wristbands, compression sleeves, catcher's masks and bats. During Players Weekend, the players also will be able to wear specially designed caps by New Era, and unique socks from Stance. Players also can wear T-shirts highlighting a charity or cause of their choice during pregame workouts and postgame interviews. Tommy Joseph, who is going to wear gold shoelaces for cancer research, turned to his friends to design the spikes that he’ll wear. It will be interesting to see how Players Weekend is received, but there seems to be some pretty cool elements to it. P.S. Chase Utley went with "Silver Fox!"